Jefferson Cleage was born into slavery about 1848 in Tennessee He first appears as a five year old in a bill of sale transferring slaves, money and household goods between the children of Samuel Cleage after his death in 1852. 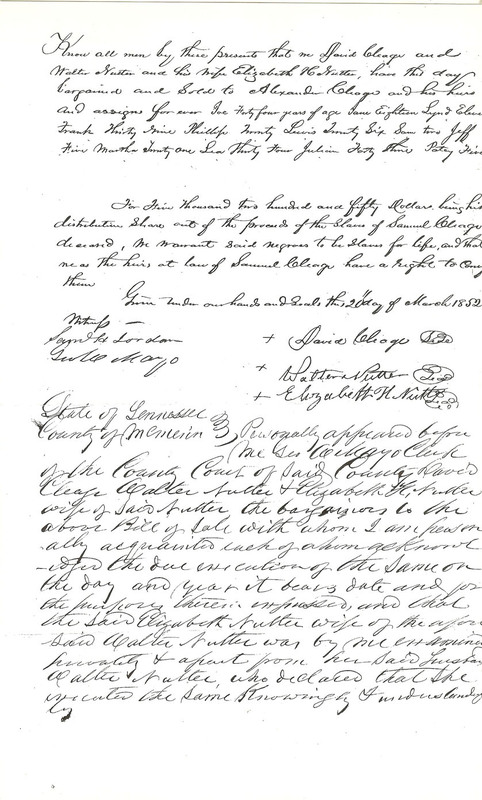 My 2X great grandfather, Frank Cleage also appears in this Bill of Sale to Alexander Cleage. I wonder if Jefferson’s parents were also transferred in the bill. Part of the Bill of Sale conveying Jeff, age 5 and my 2X great grandfather Frank to Alexander Cleage after his father Samuel’s death in 1852. In 1864 Jefferson Cleage joined the United States Colored Troops Heavy Artillery Unit at Knoxville, TN. He is the only one I have found who joined from Alexander Cleage’s plantation. The rest have been from his brother David’s plantation. Jeff was mustered out of the army and married Racheal in 1865. Jefferson was seventeen and Racheal was fifteen years old. 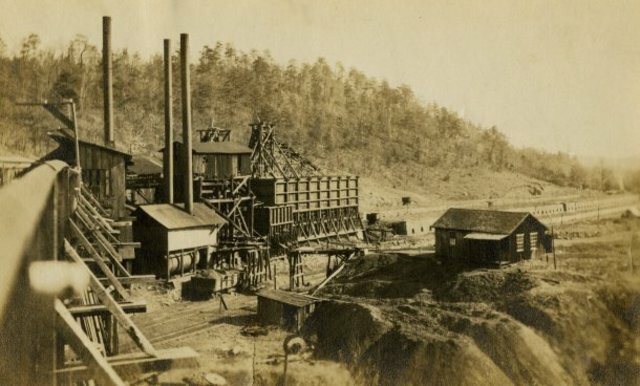 They started out in McMinn County, but by 1880 had moved to Rhea County, perhaps because of the coal mining industry that was building up there. Jefferson’s occupation is listed as farmer in the 1870 Census and as laborer in the 1900 Census. Because they don’t say what sort of laborer he was, I don’t know if he was ever involved in coal mining, but his daughter, Emma, married a coal miner in 1908 and his two youngest sons were involved in the coal mining industry by 1910. There were a number of horrific explosions in the mines. I was relived not to find any Cleages among the dead, although there were unnamed victims in each explosion. There were explosions in December of 1895, May 1901 and March of 1902. All three started when coal dust was ignited while the men were leaving with lit lamps after work. The bodies were described as blown apart, burned beyond recognition and other gruesome details. Jefferson’s wife Racheal was born about 1850 in Tennessee. She gave birth to fifteen children and by 1900, nine were still alive. Jefferson never learned to read or write. Racheal learned to read and all of the children were literate. The four younger children were all attending school in 1900. Thirteen year old Lloyd and fifteen year old Virgil had joined the adult men in the work force as laborers. The Cleages owned their home and it was free from mortgage. Jefferson died sometime before the 1910 Census. Racheal’s occupation was washerwoman. Three more of her children had died, leaving six still living. Her nineteen year old son Martin ran a steam shovel while Seventeen year old Louis worked as an iron furnace laborer. Her two year old grandson, Samuel Douglas, was also living in the house. In 1920 Racheal was about 70 years old. She and her grandson Samuel were living alone on Broyles street in Dayton. She lived in a rented house. This is the last I can find of Racheal Cleage. I was able to get a 2 for 1 with both AtoZ and Sepia Saturday! For more Sepia Saturday posts about coal, click! AMAZING history. Thank you so much for sharing it. Thank you for visiting and reading it! I was about to rail off about how I can’t believe anyone still uses coal in this day and age, but then I actually clicked on the link and was reminded that coal can be used for many uses besides (very dirty) energy production. So I guess that’s okay. As for the rest of your post, well-researched and fascinating as always. I’m glad none of them (hopefully) died in the mines. I’m still not sure about that restarting the coal mining. I saw there were other uses involved, but won’t they still be burning the coal to make the steel? Those deaths in the mine sounded so much worse then dying in your own bed with the flu or something. An impressive piece of research that links family, local and national history. My favorite way to frame my history research. The bill of sale for human beings amazes me every time I see one. “Slaves for life”…what an obscenity. Thanks as always for the interesting and well-researched post. I hate to see “slaves for life”. Knowing that the people I am writing about now lived to be free makes it more bearable. And sometimes the records just seem to come to me, not even due to my research. Fascinating stories, Kristin. Strangely, I have a distant connection to Sir Titus Salt. In 1891, at the time of the UK Census, my great-great aunt Sarah Parker (1870-1946) was working as a housemaid at Maplewell House, Woodhouse, Leicestershire, England, the seat of Sir William Henry Salt, 2nd Baronet, eldest son and heir of Sir Titus. I never expected to find a connection in that way! History really is a gigantic web. Hi. Your research has uncovered a lot about your family and others. Slavery is a sad part of American history and the stories need to be told. Thanks for sharing! I’ve got a couple of Wills and about 5 bills of sale. I’m glad they did too. Mining used to be (and often still is) an extremely dangerous occupation. 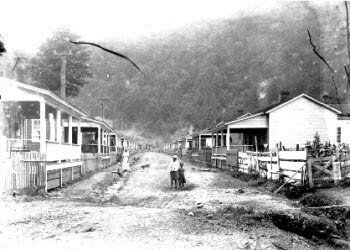 My great-grandfather came to America to work in the mines in Kentucky, but he eventually went back home… No stories were left about what it was like for him to work in the mines. I always wondered. Too bad there were no stories left. I wish there was a way we could access all those lost tales. Mining is still dangerous. Just breathing in all that coal dust is deadly over the years. Coal dust didn’t do the miners’ lungs any good, even if they were lucky enough to avoid explosions and other mine disasters, and I wonder if anyone who enjoyed sitting in front of a cosy coal fire really appreciated the work that went into obtaining that coal. That bill of sale is quite chilling to see. I meant, I know it went on, but it’s awful to see people being treated as items in what is relatively recent history. To see the names of your relatives as sale items must be quite disturbing. That poor lady, married at fifteen and producing fifteen children! The fact that she made it to 70 at all is remarkable. This is wonderful research and you tell it in a most enjoyable narrative. I can sure learn a lot from you. I’m also glad to hear about literacy being passed from mother to children, when it was probably not a high priority in a family which worked hard. Thanks.